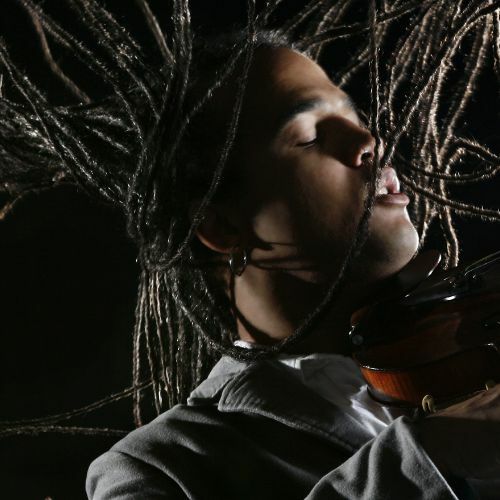 Haitian-American artist Daniel Bernard Roumain (DBR) is an innovative composer, performer, violinist, and band leader who melds his classical music roots with his own cultural references and vibrant musical imagination. The New York Times referred to him as “about as omnivorous as a contemporary artist gets,” a description borne out by his recent collaboration and performance with Lady Gaga on FOX’s American Idol. He has been voted as “America’s Assignment” on the CBS Evening News, named one of the “Top 100 New Yorkers” (New York Resident), “Top 40 Under 40” business people (Crain’s New York Business), one of the entertainment industry’s “Top 5 Tomorrow’s Newsmakers” (1010 WINS Radio), and has been spotlighted as a “New Face of Classical Music” in Esquire Magazine. DBR recently composed music for Daniel Beaty’s play Resurrection (directed by Oz Scott), the feature ESPN television segment E:60 Homeless Basketball (for which he was bestowed with a Sports EMMY nomination for Oustanding Musical Composition), and feature documentary films Strange Things by Alexandria Hammond and Off and Running by Nicole Opper, which premiered at Tribeca Film Festival and is scheduled to air nationally on PBS’ award-winning series, P.O.V. in 2010. DBR regularly composes for orchestras and chamber music ensembles around the globe and tours with his genre-jumping ensemble DBR & THE MISSION. A native of Margate, Florida, DBR studied music as an undergraduate at Vanderbilt University’s Blair School of Music, where he currently serves as a visiting professor of composition, and completed his masters and doctoral work at the University of Michigan under the tutelage of Pulitzer Prize-winning composer William Bolcom.